The Visibility group controls where particles are visible in the composition. For example, particles far away can be set to fade out, which is great for simulating fog. There is also an option to use a Z buffer from another layer, which lets you work in conjunction with a Z Buffer imported from a separate 3D modeling program. The Visibility section also holds Obscuration settings that can be used to make layers obscure the particles. At left, the full Visibility group. At right, a diagram of how Visibility works in Particular. The far distance from the camera when particles become completely invisible. Low values mean the particles are farther away and become invisible. High values mean the particles are closer and stay visible. Left to right, Far Vanish set low and high. The far distance from the camera when particles start to fade out. Low values make the fade apply itself. High values keep the fade from happening. Left to right, Far Start Fade set low and high. Left to right, Near Start Fade set low and high. Left to right, Near Vanish set low and high. The curve used to fade particles in the Near and Far Fade zones. Can be Linear or Smooth. 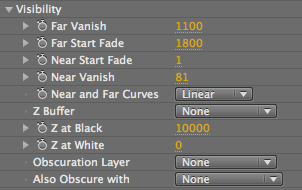 Z Buffer lets you select a 2D, comp-sized, lightness-based, linear layer to use as a Z-buffer. How's that for a mouthful? A Z-buffer contains per-pixel depth values. Typically, Z-buffering stores the Z-axis value of each pixel. This holds information about the distance from the camera viewpoint for each pixel. Z-buffering can be useful when particles are to be inserted into a scene from a 3D application (like 3DS Max or Maya). The 3D app can be configured to output a Z Buffer. (This is also known as Depth Buffer.) The Z Buffer control is not anti-aliased so its effect can look a bit rough on the object edges. In many cases, this issue doesn't matter because the particles are small and move fast. Controls what depth (=distance to camera) a completely black pixel in the Z Buffer means. Controls what depth (=distance to camera) a completely white pixel in the Z Buffer means. 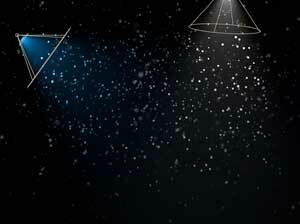 Since Trapcode Particular is applied to a 2D layer and the particles live in their own 3D world, other layers in the composition won't automatically obscure the particles. The Obscuration Layer provides a way to insert a 3D layer into the particles' world. Also Obscures With can additionally tell the Layer Emitter, Wall and Floor to obscure particles. Read more about using the Obscuration Layer.